The Fancy Rib Stitch is an elaborate variation of the traditional Rib Stitch. Knitted in a multiple of 3 stitches and in a two-row repeat, this stitch pattern is rated intermediate because of its use of moderate-level knitting techniques. Like the Rib Stitch, the Fancy Rib Stitch is stretchy which makes it perfect for projects that require a lot of give and elasticity such as cuffs and hat edgings. Row 1 (RS): *k2, p1; rep from * to the end of the row. 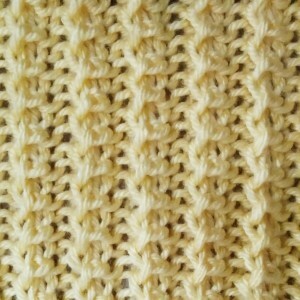 Row 2: *k1, yo, k2, pass yo stitch over previous 2 knit stitches; rep from * to the end of the row.